We prepare only poriyal, vadai and usili with vazhaipoo. I tried making bonda with vazhaipoo well. 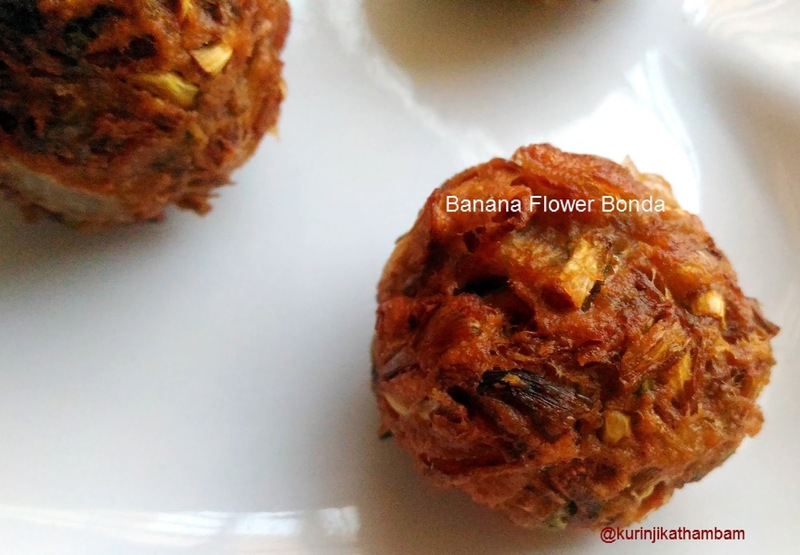 There was no bitterness in the bonda and even kids loved it. Serve with a little sauce for better taste. 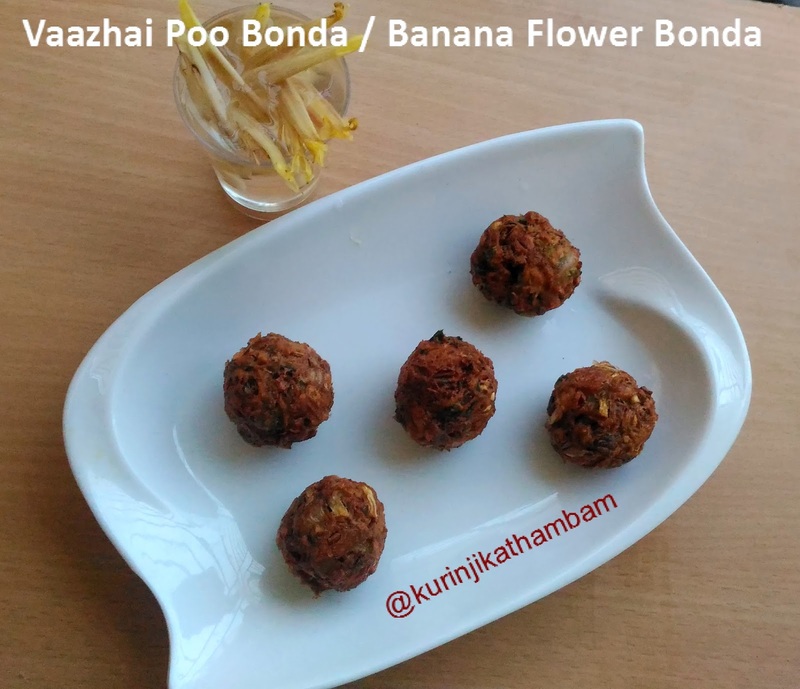 Click HERE to view Vazhaipoo Kola Urundai Recipe. Preparation Time: 15 | Cooking Time: 15 mins | Yields: 20 nos. 1. In a wide bowl, add chopped banana flower, chopped onion, curry leaves and coriander leaves. Mix them well with your fingers or spoon. 2. Add gram flour, rice flour, red chilli powder, hing and salt. Mix them well with your fingers. 3. Add water little by little and knead it into a soft dough. 4. Heat the enough oil in pan to fry the bonda. Add a pinch of the dough and put it in the oil. Suppose the small part comes up immediately, this is the correct heat for frying bonda. 5. Make gooseberry size balls from the dough and fry them in a medium flame till they become crispy and golden in color. 6. Take them out from the oil and keep it on the tissue paper to absorb the excess oil. Serve it immediately with the coconut chutney or sauce and Tea/Coffee. 1. 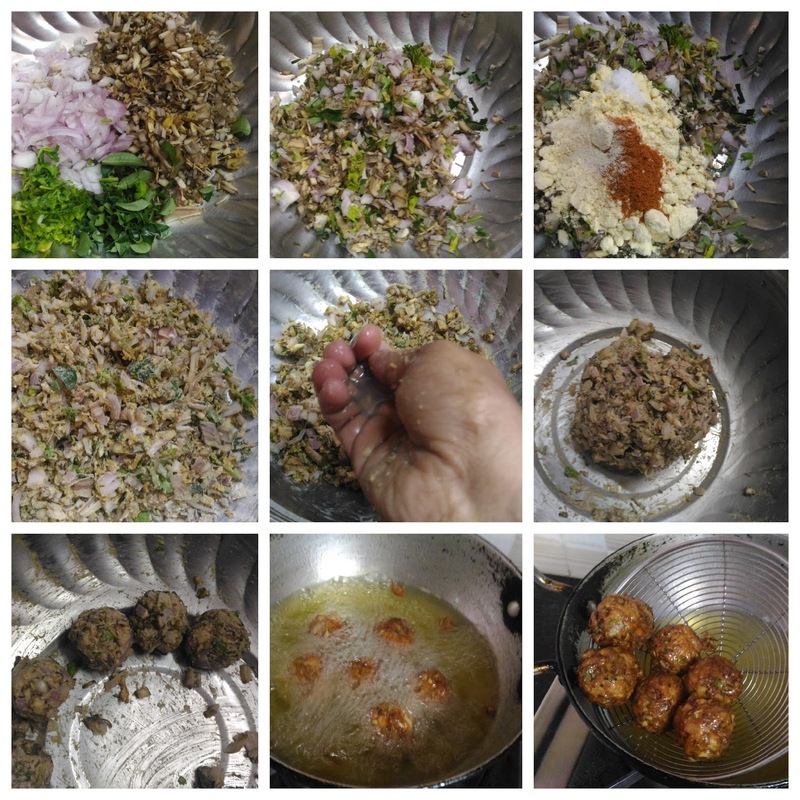 Make the bonda immediately after adding onion; because the onion releases water, so that the bonda absorbs more oil. 2. Suppose the dough is too tight add little bit water.